Anheuser-Busch InBev and Grupo Modelo are currently the number-one and -three brewers in the U.S. market, respectively. The Justice Department announced Friday that it had reached a settlement with Anheuser-Busch InBev and Grupo Modelo to resolve the anti-trust suit it filed earlier this year in response to their proposed merger. 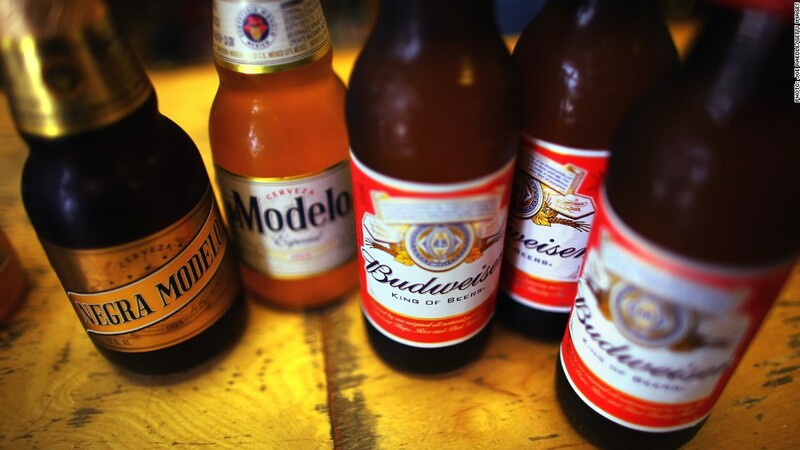 Under the agreement, Anheuser-Busch InBev (BUD) can move ahead with plans to acquire the 50% of Grupo Modelo (GPMCF) it does not already own for $20.1 billion, but it must sell Modelo's U.S. business in order to preserve competition in the American beer market. It must also sell one of Modelo's brewing facilities in Mexico. The proposed buyer is Constellation Brands -- a wine and liquor producer whose brands include Robert Mondavi and SVEDKA Vodka -- which will acquire the assets for roughly $4.75 billion. Constellation will then have the exclusive right to sell Modelo products in the U.S. The settlement is subject to a 60-day comment period before it goes before a judge for approval. The Justice Department's Bill Baer called the agreement "a win for the $80 billion U.S. beer market and consumers." "Before the merger, there were two competitors -- Modelo and ABI -- and ABI owned a substantial stake in Modelo. The companies' proposed merger would have reduced those two competitors to one -- ABI," Baer said in a statement. "The proposed settlement announced today will create an independent, fully integrated and economically viable competitor to ABI." ABI was created in 2008 when Belguim's InBev took over Anheuser-Busch in a $52 billion transaction. It currently leads all brewers with a 39% share of the U.S. beer market, producing more than 200 brands including Budweiser, Busch, Michelob and Stella Artois. Modelo, based in Mexico, is number three in the U.S. market with a 7% share. It produces Corona Extra, the top-selling import in the U.S., as well brands like Modelo Especial and Pacifico. The two companies originally announced ABI's planned takeover last year, but the Justice Department sued to block the transaction. The companies announced a revised deal in February that was largely similar to the agreement announced Friday. ABI said that once a judge signs off on the agreement, it will "move swiftly to complete the pending transactions" with Modelo and Constellation. The Modelo merger "has always been about Mexico and making Corona more global in all markets other than the U.S.," ABI spokeswoman Laura Vallis said in an email. The combination, she added, will create "a significant growth opportunity worldwide from combining two leading brand portfolios and distribution networks." As part of the new agreement, Constellation must expand production of current Modelo products for the U.S. market in order to help preserve competition. Constellation CEO Rob Sands called the deal "a significant milestone for Constellation as the most transformational event in the history of our 68-year-old company." "Overall, this transaction will nearly double the sales of our company, significantly enhance our earnings and free cash flow, diversify our profit stream and provide new avenues for growth," Sands said in a statement. Modelo did not immediately respond to a request for comment. Constellation (STZ) shares closed up 2.5% Friday following the announcement, while Anheuser-Busch InBev rose 1.7%.